So I have been rethinking my strategy for life change. Somehow I have to get back to moving forward. Shutting off the news (which brings me down big time). I can’t change the world by being immersed in the election or the sadness and tragedy worldwide. I can be an element for change by listening to the truth of what Jesus said and allowing it to permeate my life. Instead of focusing on the brokenness and despair that the new portrays I can focus on the truth of the Good News (gospel). Jesus said, “A thief comes only in order to steal, kill and destroy. I have came that they may have and enjoy life, and have it in abundance (to the full, till it overflows).“ John 10:10 AMP I have to look at what the thief (Satan) is using to steal, kill and destroy me. Some things I can do something about, some I can’t. I can turn off the television which steals my time and emotional energy. I can spend time meditating on the Word of God and praying, taking time to be quiet before the Lord so that He can speak into my heart. I can pray for those I love, that the Lord will guide them and keep them safe. Worrying about my loved ones and becoming distracted by some of the things they say and do that hurt and wound does not help anyone. Some of my relationships seem to be irreparably damaged and at this present time the only thing I can do is pray. 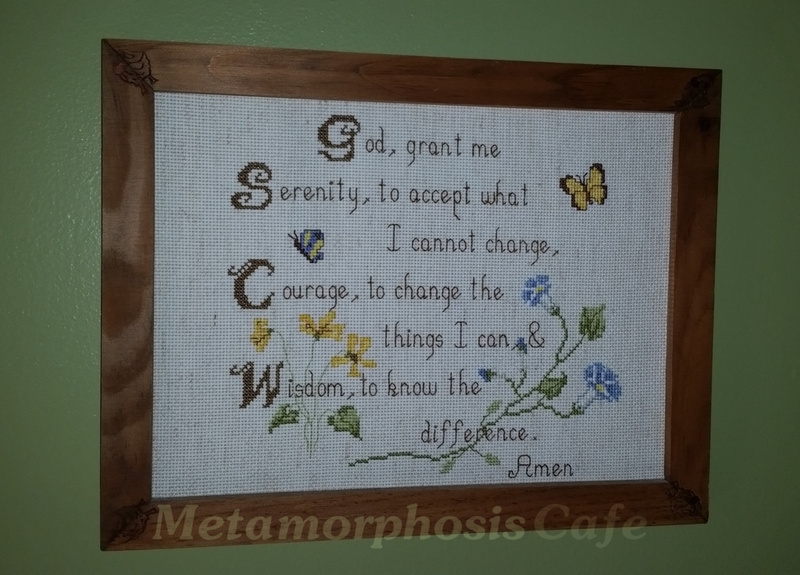 I love the serenity prayer: Lord grant me the serenity to accept the things I cannot change the courage to change the things I can and the wisdom to know the difference. My mother did a needlepoint of this prayer years ago and when she downsized I grabbed it. It is the first thing I see in the morning and the last thing I see at night. It hangs by my bed. I have striven to heal relationships in the past in my own power and have only made it worse. I realize that it is something I have to let go and allow God to work on. (That doesn’t mean I don’t get riled up emotionally on occasion losing sleep and valuable energy over it). That is why I must see this reminder daily. My emotional state affects everything in my life. Stress has wracked my body with all kinds of crazy symptoms. And I am a stress eater. The only way to not allow stress to take hold is to lean deeper into Jesus. I hate to say it but I have always struggled to stay on an even keel with my spiritual walk. I wander off the path and go through many wildernesses of my own making. (I said I was confessing here) I know where my peace lies, and yet I allow the distractions of life to interfere far too often. Thankfully Jesus doesn’t let me go and he is faithful. “If we are unfaithful, He remains faithful , for he cannot deny who he is.” II Timothy 2:13 NLT I am so thankful for that. He continues to draw me back to himself. Today I rest in Him and His promises to me and I am thankful that today is a new day!